It has been said that a myth is a story about the way things never were but always are. 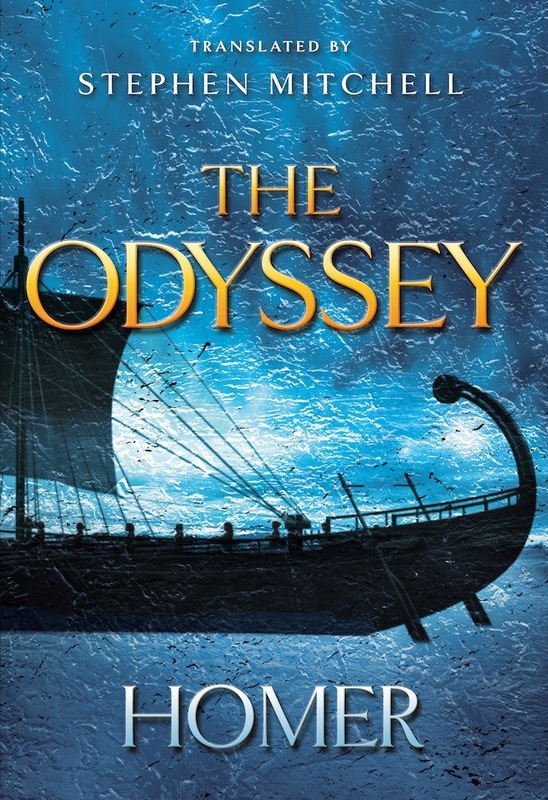 The Odyssey is the original hero’s journey, an epic voyage into the unknown that has inspired other creative work for millennia—from ancient poetry to contemporary fiction and films. With its consummately modern hero, full of guile and wit, always prepared to reinvent himself in order to realize his heart’s desire—to return to home and family after ten years of war—The Odyssey now speaks to us again across 2,600 years. Stephen Mitchell’s translation brings Odysseus and his adventures vividly to life as never before. His muscular language keeps the diction close to spoken English, yet its rhythms recreate the oceanic surge of the ancient Greek. Full of imagination and light, beauty and humor, this Odyssey carries you along in a fast stream of action and imagery. One-eyed man-eating giants, irresistibly seductive sirens, shipwrecks and narrow escapes, princesses and monsters, ghosts sipping blood at the Underworld’s portal desperate for a chance to speak to the living, and the final destruction of all Odysseus’s enemies in the banquet hall—these stories are still spellbinding today. So, too, are the intimate moments of storytelling by the fire, of homecoming and reunion, fidelity and love—all of greater value to Odysseus, and to us, than the promise of immortality. The first translation to benefit from modern advances in textual scholarship, Mitchell’s Odyssey also includes an illuminating introductory essay that opens the epic still further to our understanding and appreciation, as well as enlightening textual notes that will benefit all readers. Beautiful, musical, accurate, and alive, this Odyssey is a story for our time as well as for the ages. so the sun god destroyed them and blotted out their homecoming. you wish to, and tell the story again, for us. Right away Hermes did as Zeus had commanded. troughs of the waves and moistens its wings in the spray. until he came to the cavern where the nymph lived. racking his heart with groans and with bitter weeping. then asked, “What brings you here, Hermes? This is an honor. You are always most welcome—and what a long time it has been! why I have come here, and I shall tell you the truth. It was Zeus who sent me; I came here at his command. where mortals make their due offerings to the gods? who has suffered more than all others who went to Troy. and she raised fierce winds and violent waves against them. to the keel for dear life, the high winds carried him here. Zeus tells you to let him go now, immediately. even if she has chosen him as her husband. Ártemis hunted him down in Ortýgia and shot him. and, furious, struck him dead with a bolt of lightning. had blown it apart with lightning on the dark sea. Hermes answered her, “Good. See that you do it. for Ithaca. No longer did the nymph please him. but there was no choice; she was passionate, and he had to. over the restless sea and shed bitter tears. and Odysseus followed after her, in her footsteps. and her handmaids brought out ambrosia and nectar for her. to your own dear country? Well, I wish you the best. that Penelope isn’t as tall as you or as lovely. As they were speaking, the sun set and darkness came on. with great pleasure, and then they slept in each other’s arms. welling up through them, to clean the dirtiest clothes. making a game to see who could finish first. lapped at the land and washed all the pebbles clean. and waited there for the clothing to dry in the sun. to the rhythm, while Nausícäa led them in song. just so did the princess stand out among her handmaids. and on top of them was a frieze of dark-blue enamel. was of silver too, and the door’s great handle was golden. over the palace, sentries unaging and deathless. to light up the room for the banqueters all night long. and intelligence to make things of surpassing beauty. glossy apples, sweet figs, and flourishing olives. that some fruits were budding while others were growing ripe. and fig after fig—they were always coming to fullness. to the house, and from it the townspeople drew water. upon the king, Alcínoüs, and his people. six of my comrades—beautiful, strong young men. and they shouted to me and called out my name for the last time. sickening thing I ever saw on my travels. and untied the mooring cable from the pierced stone. as he passed through the wars of men and the bitter sea. But now he was sleeping peacefully, free from all troubles. “Look what we have here: garbage walking with garbage. who will get on all fours to lick the plates at our table. guest would be given. But why don’t you hand him to me? a few cups of whey to fatten those scrawny thighs. of scraps to fill his bottomless pit of a belly. Meanwhile Odysseus arrived, along with the swineherd. “This house right here must be Odysseus’s palace. or you stay here if you wish, and I shall go first. You go in first, and I shall remain behind. and if I must suffer another hardship, so be it. and their anger at Telemachus turned to amusement. and she bolted the doors that led to the women’s quarters. with a sound as beautiful as the voice of a swallow. “Telemachus, look, your house guest hasn’t disgraced you! however the suitors taunted me with their insults. by the chair near his father, armed in glittering bronze.